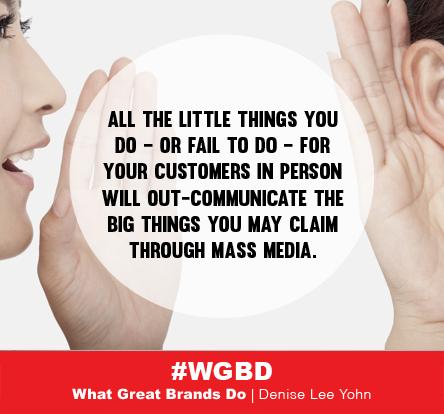 From What Great Brands Do: All the little things you do — or fail to do — for your customers in person will out-communicate the big things you clam through mass media. This is a good reminder in this season of big budget advertising campaigns. According to a recent study from Nielsen, last year’s fourth-quarter represented more than half of ad spending in the jewelry, video games and toy sectors for all of 2013. Advertisers in traditional gift segments, such as jewelry and tech products, spent nearly $2.5 billion during the fourth quarter holiday season last year. I wonder how much these same companies have invested in employee training, customer service, and customer experience design?! !